Andrew Shaw bringing NHL’s Holy Grail back to his roots. From left to right, Doug Shaw, Andrew Shaw, Darlene Shaw, Chaunette Boulerice and Jason Shaw celebrate following the Chicago Blackhawks' Stanley Cup victory. Photo submitted by Darlene Shaw. After winning a Stanley Cup in just his second season, Belleville’s Andrew Shaw will bring Lord Stanley back to his hometown next week. Shaw will have his day with the cup next Thursday. He will show off the cup all over the Quinte area in both public and private events. He is excited to give back to the community that has made him who he is today. “Belleville has been good to me. This community has always supported me and my family. It will be nice to finally give back to them. I’m excited to see all those smiles on those kids’ faces,” said Shaw. He will bring the cup to the Air Museum in CFB Trenton from from 1:30 to 2:30. He will then make his way to the Memorial Arena in Belleville to show off the cup from 3:30 to 6. He loves that the NHL gives him the opportunity to bring the Cup back to his roots. “It’s huge. It’s one of the things that the NHL is known for. They are always giving back to the fans, always willing to support. It just shows that we couldn’t do it without all the fans out there, so it’s kind of giving back to them,” said Shaw. Shaw said he couldn’t be where he is today without the Belleville community and most importantly, his parents. “I couldn’t do it without them. They put a lot of time into it, growing up you know driving to Toronto every weekend, spending a fortune on gas and hotels and food. Giving up their free time just to help out me and my brothers and my sister,” he said. He said this experience is what he has been dreaming of since he was a little boy. “It’s a dream come true. It’s something every kid dreams of. Whether they are playing on the street with all their buddies or their first hockey game learning how to skate, it’s the moment you dream for and the moment you work for,” he said. 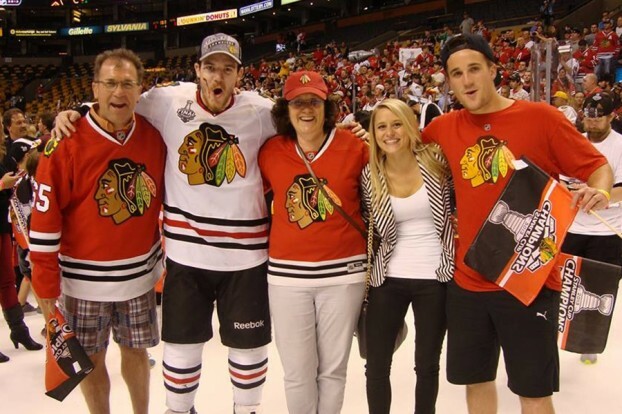 When it comes to planning the cup’s visit, everything is left up to the Shaw family. Andrew’s mother Darlene Shaw said she decided to take over and make sure everything was organized properly. She said she is really proud of the area that helped raise her son into the man he is today. “He’s bringing it back to his roots. Everything that he has accomplished, he’s accomplished because of the area. His coaches, the organizations and the people that run those organizations. It just makes me really proud of the area all together,” said Darlene. Darlene said it was difficult to decide where to bring the cup. “It was hard. I wish he could spend the whole day with the public but it’s hard. He’s only got so much time and being the lowest post on the totem pole, he only gets it for one day. Unfortunately it’s during the week. It was a very difficult decision but you have to stop at sometime.” she said. The Shaw family has organized some private functions during their time with the cup, but hope to get as many people in during the public showings. For Darlene, everything has been a blur since her son won the Stanley Cup. From parades and celebrations in Chicago to coming back home and getting back to work, she and her husband Doug haven’t had the chance to sit down and think about it all. “We are very proud of him. He has worked very hard for this. Right now that’s about all we can say about it. We are so proud of him. He has done amazing. In his public speakings and everything, we are just really pleased with him,” said Darlene. When the family does finally get some time to think, they will all be there with Andrew. “We will all be there. His two brothers and sister have it off and now, his grandmothers will be with him and his aunts and uncles and their children,” she said. Next Thursday is approaching quick. Darlene and the Shaw family are hoping that everything goes as planned. “I just hope it gets here and it’s all planned. It’s coming awfully quick. It’s a lot of scrambling to get things done right now,” said Darlene.